Got a plan to get us back to the Moon? NASA's got $30 million worth of motivation! In the clearest indication yet that the future of space exploration lies as much in the private sector as government agencies, NASA announced it's offering $30.1 million for the first commercial group to land a probe on the Moon. 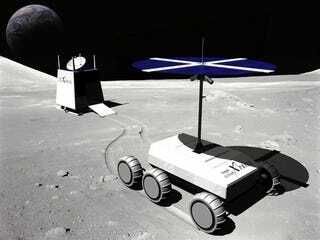 Specifically, NASA says it will buy data from whoever can successfully design a lunar rover and actually get it to the Moon. This basically doubles Google's Lunar X prize, which offers 30 million to the first successful commercial moonshot. This is a huge boon to the 21 different developers gunning for the Google prize, because many had already incorporated data purchases from organizations like NASA into their business model, and the chance of a 60.1 million dollar payday should provide ample incentive for one of the companies to succeed. [NASA] challenges industry to demonstrate Earth-to-lunar surface flight system capabilities and test technologies. Data provided to NASA should include information related to landing using a human mission profile; identification of hazards during landing; precision landing; and imagery and long-duration surface operations. [NASA] asks for information about the design and demonstration of an end-to-end lunar landing mission. This includes data associated with hardware design, development and testing; ground operations and integration; launch; trajectory correction maneuvers; lunar braking, burn and landing; and enhanced capabilities. This is potentially a big win-win for NASA, as it can help support the advancement of space travel while still only spending a fraction of the money it would take to send one of its own probes to the Moon. Like the Lunar X prize, there is a time limit on the prize - companies only have until 2012 to collect the full 60.1 million, after which both the Google and NASA sides of the prize shrink. After that, NASA says it will offer up to 15 million for data until 2014, and if nobody has claimed the money by then, the offer expires.